Panelists spoke about journalism at the Walpole Town Hall on Feb. 28. 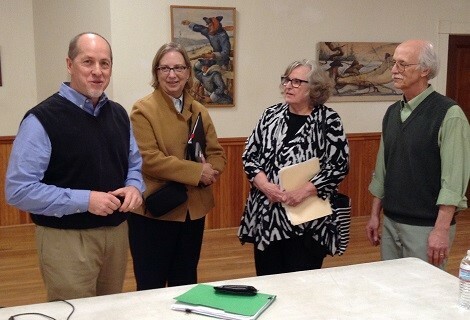 From left they are Paul Miller of the Keene Sentinel, Dr. Kristen Nevious of Franklin Pierce University, Nancy West of InDepthNH.org and Ben Daviss of Fall Mountain Alliance. This article was first published on the Fall Mountain Alliance website, a Walpole group committed to informed engagement. Addressing the challenges journalism faces today, a three-person panel with varying ties to the field — researcher, editor, reporter — spoke and answered questions in front of an audience of 60 at the Walpole Town Hall, the evening of February 28th, in a forum sponsored by the Fall Mountain Alliance and moderated by long-time science journalist Ben Daviss. Nancy West, after 30 years as general assignment reporter for the New Hampshire Union Leader, now the publisher of InDepthNH.org, a nonprofit center for public-interest reporting in New Hampshire, which she founded in 2015. She has been honored by both the New England Press Association and New Hampshire Press Association for government reporting. Dr. Kristen Nevious, director of the Marlin Fitzwater Center for Communication at Franklin Pierce University. Paul Miller, executive editor of the Keene Sentinel where he’s been for 35 years. He is a member of the board of directors of the New England Society of Newspaper Editors and a three-time New Hampshire Newspaper Columnist of the Year. He still writes his occasional “Out in Public” column in the Sentinel. Moderator Daviss has been an independent magazine journalist for more than 35 years, with articles in Discover, Smithsonian, and in more than 40 other publications on four continents. “It’s the wild west,” said West of conditions for journalists today. The panelists talked of shifting technologies, sharpening divides, and the increasing role of belief and doubt in confounding journalistic efforts to convey information. They also addressed responses to such challenges. “I was an expert at changing typewriter ribbons,” said Nevious of when she started out. ”Now students are using SD cards.” She talked of the multi-tasking that today’s students must do — tweet, take video, do an interview, send back to the station–illustrating the wide range of new technologies involved in transmitting print, video, and audio aspects of a story. News consumers have followed the technology. “Two-thirds of people get their news on social media,” she noted. This move has hit newspapers hard. West observed “In 2000, the New Hampshire Union Leader had 28 reporters. Today it has six.” She added that the number of news jobs declined statewide over 56% from 2000 to 2016. As newspapers struggle to adapt and survive, they also operate in a more fractious environment. Miller said, “There are two disruptors: the political divide and the growing wage gap. Another challenge to journalists is misinformation, which Miller sees as “pervasive” and “push-button simple.” The proliferation of fake news has brought new attention to something that Nevious says has been around for a long time with many names — rumor, impostor, lies, hoax, fabricated reports, weaponized information. She gave an example (citing the Newseum, 11/14/16) when in the 1800’s, The Sun in New York circulated a story about bat-like creatures on the moon — a hoax done to boost sales and divert attention from the issue of the abolition of slavery. The anonymity available on the Internet, she observed, eases the spread of unsubstantiated news. Other examples she gave highlighted the reach, power, speed, and scope of fake news. The Pizzagate conspiracy story, she pointed out, prompted someone to show up at the restaurant with a gun. In the case of the Parkland shooting, she said the Washington Post noted in a 2/27 story that “forty-seven minutes after news broke” messages appeared on an anonymous chat board seeking Jewish involvement and crisis actors. Russia has long tried to plant misinformation in the American public to roil the waters (with fake stories, she said, drawing on examples revealed in a Chicago Tribune article 2/22, that President Kennedy’s assassination was directed by the FBI and CIA and that the AIDS virus had been manufactured by the U.S.). Such weaponized information has been vastly empowered by the advent of the Internet, as evidenced, she noted, by the recent indictments by special counsel Robert S. Mueller III who’s investigating whether Russia tried to influence the 2016 presidential election. Fixes lag woefully behind. She noted the case of Miami Herald reporter Alex Harris whose tweet was hacked during the Parkland school shooting to say that she was looking for pictures of dead bodies. While Twitter could address the problem of an account that had been taken over, Nevious said, it didn’t have an immediate fix for a single hijacked tweet. In addition to dealing with such increasingly murky waters, the environment has turned hostile for journalists. “We have a President who’s declared the media a public enemy,” Miller observed, and referenced Trump’s practice during campaign rallies of confining reporters to a specified area and then deriding them, riling up the crowd. The panelists also talked of ways journalists and news consumers can address these challenges. As to the threat posed by fake news (and cries of ”fake news” aimed at legitimate news), Nevious said, we need to ”learn how to navigate that sea of information.” She said 25 states and Washington, D.C. have introduced or passed bills regarding news and media literacy, including Massachusetts, Rhode Island, and Connecticut — but not, she emphasized, New Hampshire or Vermont. She said we need to foster skepticism without crossing over into cynicism. Who is the author of the article? (name, qualifications)? How is it being conveyed? Language used (emotive or factual)? Use of caps? Check the About Page for who is running the site. Are there disclaimers? Is it satire? To trace who owns a domain, use ICANN Whois Lookup. Be wary if the owner is not available. With Chrome, right-click on the image to search in Google. TinEye will trace an uploaded image and return a list of places it is used. Miller said we need to do “a better job of recognizing misinformation.” Nevious later indicated a few of some 48 fact-checking sites: Factcheck.org, Snopes.com, and Politifact.com. Beyond accountability, credibility, and transparency is also the sheer insistence on basic coverage. After the forum, Miller said that when Trump barred the Washington Post from access, the Post responded by saying they were going to have 35 reporters cover him 24/7. What they cover is also key. West seeks to “give voices to marginalized people, places, and ideas.” Along similar lines, Miller talked of the importance of understanding their readers, as well as those who are not reading them. He also talked of the need to understand the partisan divide between Democrats and Republicans and how it surfaces in the topics that interest them He noted, “A Knight Foundation report found that Democrats were more likely to read about social issues, natural disasters, the environment, science, and technology. Republicans are more apt to read stories about traffic and weather, business and the economy, and crime and public safety.” Summarizing that, he said, “Democrats’ interests are more outwards, aimed at improving the world and Republicans’ interests are more inwards–utilitarian, improving the quality of daily life.” He cautioned care in the use of analytics, but considers them to the extent they increase understanding. As to what those who seek out news can do, Miller replied, “Engage us.” West elaborated, “Read us. Write checks. Support letters to the editor. Call.” And in follow-up after the event, Nevious pointed out that news used to be a noun. Now it’s a verb. Ben Daviss began a career in journalism as a copy boy with the old Minneapolis Star newspaper and has been an independent magazine journalist for more than 35 years. His articles have appeared in Money, Discover, Smithsonian, New Scientist, Air & Space, and more than 40 other publications on four continents. Megan Hughes is a library clerk with a journalism degree. Dennis Marcom is a timber frame carpenter and safety guy at Benson Woodworking interested in wooden structures for good living and honest communication for a good country. All three are members of Reality Check, a group focused on journalism issues and a branch of the Fall Mountain Alliance.